There are several varieties of the herb thyme, but the ‘common’ thyme used for the production of thyme essential oil is believed to be an improved, cultivated form of the wild thyme which originated in the mountainous regions of Spain and Europe. This plant is the thymol chemotype of the herb Thymus vulgaris which belongs to the Lamiaceae (also known as the Labiate) family. Different chemotypes are developed by plants as a response to ecological influences such as the altitude it is grown at, its geographical location, the amount of sunlight it receives, humidity, rain, and even the amount of wind it is subjected to. There are several other chemotypes of Thymus vulgaris, including linalool, geraniol, thuyanol and paracymene, all of which are available as a thyme essential oil – but not in large quantities. Thymus vulgaris is a strongly aromatic perennial plant that grows close to the ground in dense patches, typically reaching no more than 30 centimetres (12ins) in height. It has a woody, fibrous root, numerous narrow wiry stems, and small (4-20mm) narrow, hairy, green-grey leaves arranged in opposite pairs. The small attractive flowers may be white, pink or purple according to its geographical location, and they grow in dense clusters. Thyme dislikes an excess of moisture, preferring to grow in dry, stony soil which are very much the same conditions preferred by lavender. It thrives best with lots of room for it to spread its flowered stems and deep roots. The whole plant is highly aromatic, producing a pleasing sweet, herbaceous and slightly balsamic fragrance. Like many other plants of the Lamiaceae family, thyme was native to the Mediterranean but has now spread throughout the world and is found growing wild or cultivated abundantly in Algeria, China, France, Portugal, Italy, Israel, Morocco, Spain, Russian Federation, Tunisia, Turkey and USA. 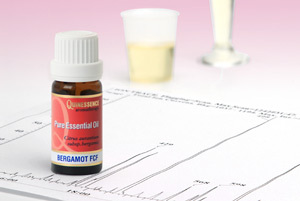 The main countries producing thyme essential oil (ct. thymol) today, are France, Spain, Morocco and USA. Since records began thyme was believed to instil courage and strength; Roman soldiers would bathe in thyme before going into battle, and during the Middle Ages in England ladies commonly embroidered an emblem of a bee hovering over a sprig of thyme on scarves they would give to their knights. The thyme on this emblem symbolised activity, bravery and energy. Scottish highlanders drank a tea made of wild thyme to gain courage before battle and to also ward off nightmares. The ancient Egyptians used thyme in the process of mummification, the Sumerians employed it as an antiseptic and the Greeks used it in religious cleansing ceremonies and medicine. The great Roman writer Pliny (c23-79 AD) who was an authority on all things scientific in Europe wrote, ‘when burnt, it puts to flight all venomous creatures’. He also recommended it as a treatment for epilepsy. 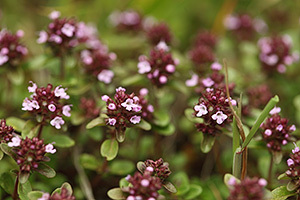 Essential oil of thyme is extracted from the partially-dried leaves and flowering tops by water or steam distillation. The resulting oil is a red-brown or orange-brown colour with a medicinal, herbaceous aroma with subtle sweet and spicy overtones. This is known as red thyme essential oil, but to meet the requirements of various industries this oil it is usually re-distilled to reduce the high level of phenols (thymol and carvacrol), which leaves the oil virtually colourless. This rectified oil is known as white thyme essential oil, although other species of thyme such as Thymus serpyllum also yield a colourless or pale yellow essential oil directly upon distillation. White thyme essential oil is especially valuable during winter because it is a powerful and wide-ranging antimicrobial and anti-infectious oil that can be used to help prevent the spread of disease such as bronchitis and influenza. When vaporized, the expectorant properties of thyme essential oil stimulates the expulsion of catarrh and its antispasmodic action calms uncontrollable coughing. Thyme oil’s powerful bactericidal action effectively kills infection just as Culpeper recorded. Regular use of thyme oil also increases the production of white blood cells in the body, helping to build resistance to disease. During the First World War, thyme essential oil was used in hospitals to sanitize the wards and operating theatres, and it is still used in the pharmaceutical industry for the manufacture of cough medicines, mouthwashes and toothpaste. Clinical trials have shown that thyme oil is highly effective against MRSA (Methicillin-resistant Staphylococcus aureus). Thyme essential oil is also helpful in massage for relieving the symptoms of arthritis, gout, rheumatism, poor circulation, and muscular aches and pains. Research has recently revealed that the oil is also an effective antioxidant and safer than benzoyl peroxide when used in acne treatment blends. Thyme is an extremely valuable essential oil in aromatherapy, but never exceed a concentration of 2% and avoid mucous membranes or damaged skin since its powerful action may cause skin irritation if used carelessly. This is why white thyme essential oil is normally used in aromatherapy, since it is less irritant than red thyme. However, used correctly and in moderation it is perfectly safe. It blends well with bergamot, grapefruit, lemon, lavender, orange, marjoram sweet, melissa, pine, rosemary, sage and tea tree. The name thyme in its Greek form was first given to the plant by the Greeks as a derivative of the word 'thymos' or 'thurmo', which meant 'to perfume or fumigate'. This probably came about because it was commonly used as incense due its sweet, herbaceous and balsamic fragrance. Another school of thought is that the name is derived from the Greek word 'thumus', which signifies courage. In 1603 the powerful antiseptic action of thyme was used to ward off the 2nd visitation of the Black Death. Culpeper (1616-1654) wrote of thyme; "It is a noble strengthener of the lungs, as notable a one as grows, nor is there a better remedy growing for that disease in children which they commonly call the Chin-cough (whooping cough). It purgeth the body of phlegm and is an excellent remedy for shortness of breath." 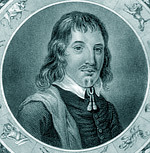 Hundreds of years later science would prove that Culpeper had been absolutely right with his therapeutic assesment of thyme.